Amada PEGA-344Q mdl. PEGA-304040 30 Ton CNC Turret Punch Press s/n P3440603QL w/ Fanuc Series 6M Controls, 40-Station Turret, 350 Strokes/Min, Manual Sheet Reposi- tioner, 49” x 77” Ball-Top Table. Amada OCTO-334 30 Ton – 8 Station CNC Punch Press s/n 3440555 w/ Fanuc Series 6M Controls, 25” x 99” Ball-Top Table, Flip-Up 21 3⁄4” x 47” Front Table. 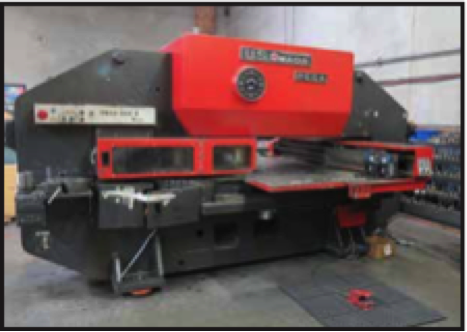 Amada RG-50 50 Ton x 80” CNC Press Brake s/n 504952 w/ Amada D-9E Controls, 78.8” Table Length, 82.1” Max Bend Length, 59.9” Between Uprights, 15.76” Throat, 3.94” Stroke 14.58” Open Height. Amada RG-35S 35 Ton x 48” CNC Press Brake s/n 356422 w/ Amada NC9-EX II Controls, 47.3” Table Length, 49.3” Max Bend Length, 40.2” Between Uprights, 7.88” Throat, 3.94” Stroke, 14.58” Open Height. Amada M-2045 3/16” Cap x 78” (2000mm) Power Shear s/n 2401865 w/ Amada Controlled Back Gaging, 84” Squaring Arm, Front Material Supports. Amada CSW-220 8 5/8” x 8 5/8” Power Corner Notcher / 2” x 4” Coping Notcher s/n 2401865 w/ Fence Systems. 2007 PemSerter Series-4 6 Ton x 18” Hardware Insertion Press s/n J4-3729. PemSerter PS-4 6 Ton x 18” Hardware Insertion Press s/n E4-840 w/ Tooling. Thor Tool & Die mdl. 1210 10-Station Turret Punch w/ Fence, Stand. Amada MT mdl. TEC-160 Punch and Die Tool Grinder. Amada Punch Die Grinder. Amada MT mdl. TEC-160 Punch and Die Tool Grinder. Jet mdl. SR-2236 22GA x 36” Hand Roll w/ 2” Rolls. Pexto mdl. PR-107 20GA x 12” Hand Roll w/ 1” Rolls. Miller Syncrowave 250DX CC-AC/DC Squarewave Welding Power Source s/n LB214110 w/ TIG-Runner Cooling Cart. Weldscale 60” x 72” Forming Table w/ Tooling. Champion / Gardner Denver mdl. EFD99A 40Hp Rotary Air Compressor s/n 1088150 w/ Digital Controls, 125 PSIG, 240 Gallon Air Storage Tank. (3) Frejoth 12-Speed Pedestal Drill Presses. Pro-Tech 4” Horizontal Band Saw w/ 3-Speeds. (2) Wilton 1” Belt / 8” Disc Sanders. Makita 12” Abrasive Cutoff Saw.